NASA's Kepler mission has discovered the first Earth-size planets orbiting a sun-like star outside our solar system. The planets, called Kepler-20e and Kepler-20f, are too close to their star to be in the so-called habitable zone where liquid water could exist on a planet's surface, but they are the smallest exoplanets ever confirmed around a star like our sun. The discovery marks the next important milestone in the ultimate search for planets like Earth. The new planets are thought to be rocky. 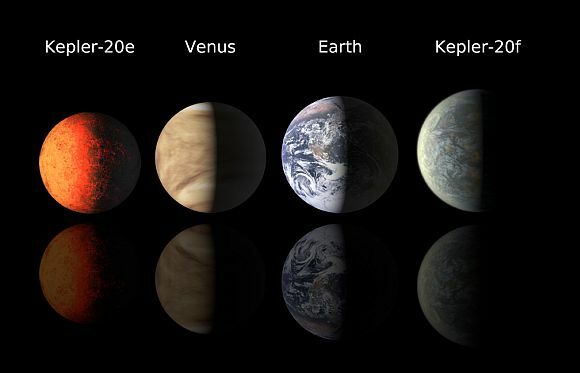 Kepler-20e is slightly smaller than Venus, measuring 0.87 times the radius of Earth. 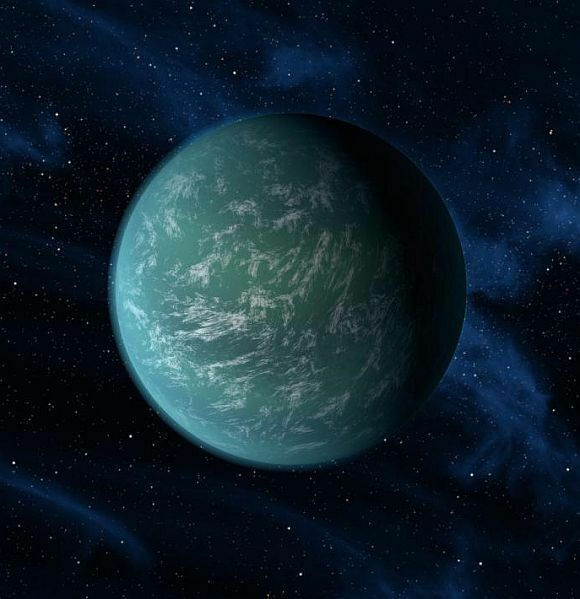 Kepler-20f is a bit larger than Earth, measuring 1.03 times its radius. Both planets reside in a five-planet system called Kepler-20, approximately 1,000 light-years away in the constellation Lyra. Image: The first two Earth-sized exoplanets found by Kepler are shown here in comparison to Earth and Venus. "The primary goal of the Kepler mission is to find Earth-sized planets in the habitable zone," said Francois Fressin of the Harvard-Smithsonian Center for Astrophysics in Cambridge, Massachussets, lead author of a new study published in the journal Nature. "This discovery demonstrates for the first time that Earth-size planets exist around other stars, and that we are able to detect them." Image: Kepler-20e is the smallest planet found to date orbiting a Sun-like star. It circles its star every 6.1 days at a distance of 4.7 million miles. At that distance, its temperature is expected to be about 1,400 degrees F. This is an artist's rendering. "The Kepler data are showing us some planetary systems have arrangements of planets very different from that seen in our solar system," said Jack Lissauer, planetary scientist and Kepler science team member at NASA's Ames Research Centre in Moffett Field, California. "The analysis of Kepler data continue to reveal new insights about the diversity of planets and planetary systems within our galaxy." Image: Kepler-20f orbits its star every 19.6 days at a distance of 10.3 million miles. Although its average temperature could be as high as 800 degrees F, it might have been able to retain a water atmosphere as it migrated closer to the star after it formed. This is an artist's rendering. The Kepler space telescope detects planets and planet candidates by measuring dips in the brightness of more than 150,000 stars to search for planets crossing in front, or transiting, their stars. The Kepler science team requires at least three transits to verify a signal as a planet. Image: The Kepler-20 planetary system contains five planets that alternate in size: large, small, large, small, large (as shown in this artist's rendering). All five orbit their star closer than the planet Mercury in our solar system. 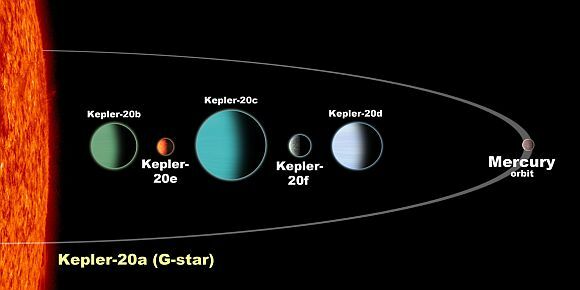 Although too hot to be hospitable to life, Kepler-20e and -20f are the first Earth-sized planets to be discovered orbiting a distant star. In this artist's rendering, the planetary sizes are to scale but their orbital spacing is not. 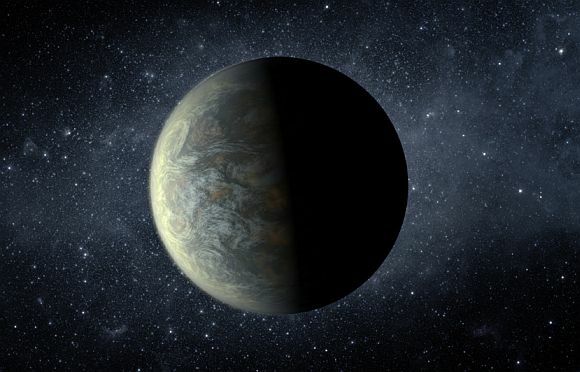 On December 5 the team announced the discovery of Kepler-22b in the habitable zone of its parent star. It is likely to be too large to have a rocky surface. While Kepler-20e and Kepler-20f are Earth-size, they are too close to their parent star to have liquid water on the surface. NASA's Ames Research Centre in Moffett Field, California, manages Kepler's ground system development, mission operations and science data analysis. JPL managed the Kepler mission's development. 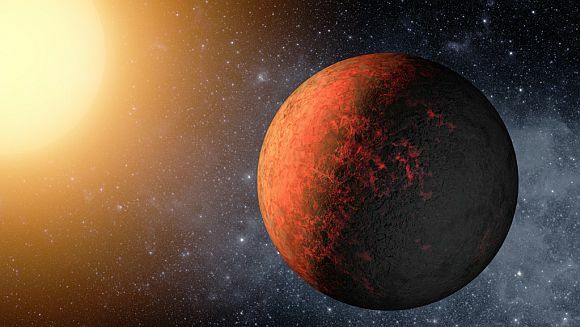 Image: This artist's conception illustrates Kepler-22b, a planet known to comfortably circle in the habitable zone of a sun-like star. It is the first planet that NASA's Kepler mission has confirmed to orbit in a star's habitable zone -- the region around a star where liquid water, a requirement for life on Earth, could persist. The planet is 2.4 times the size of Earth, making it the smallest yet found to orbit in the middle of the habitable zone of a star like our sun.